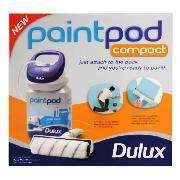 Dulux paint pod compact £5 delivered to store @ Tesco, cheapest available. Says reduced from £11 but think original price was around £40. Superb find just ordered, thanks OP! really, its working for me. wheres best to get the paint for these?....any ideas? -We started off so well paying over the odds to get this system so we could quickly paint a room with out any mess, it took half an hour to read instructions and set up fit batteries etc. 2-The first wall we were impressed with so it does work, but would say with all the messing around a normal roller would of been quicker and simpler, you can get ceiling rollers that are designed the same to cut down spray-but I found just going slower with a normal roller is best. 3-The paint was double normal paint and you can only use there pods,the machine came free when we bought two pods. 4-Tap connection for washing the system is for round tapes only, bit of a problem when we tried to clean before returning for a refund, would not fit any of our taps. 5-The trigger water proof guard fell off after first wall and we could not get back on-very flimsy, This rubber guard holds the switch lever position which falls out, even if we had a replacement this switch would soon fall to pieces again. 6-The paint stopped coming through the roller and was filling the handle and coming out of switch and handle connections, we took off and confirmed nothing was blocked including roller, put it all back together and the same happened, now we had paint blobs every where and this quick job had become a NIGHTMARE, we returned for A refund and raced out to purchase normal paint and roller and successfully completed in a couple of hours. 7-My advice stay away it's a costly gimmick also if you have not cleaned correctly next time you'll have to buy another to use any paint left over. can the compact use the standard paint pods? was what i meant to ask or is it smaller pods? -We started off so well paying over the odds to get this system so we … -We started off so well paying over the odds to get this system so we could quickly paint a room with out any mess, it took half an hour to read instructions and set up fit batteries etc.2-The first wall we were impressed with so it does work, but would say with all the messing around a normal roller would of been quicker and simpler, you can get ceiling rollers that are designed the same to cut down spray-but I found just going slower with a normal roller is best.3-The paint was double normal paint and you can only use there pods,the machine came free when we bought two pods.4-Tap connection for washing the system is for round tapes only, bit of a problem when we tried to clean before returning for a refund, would not fit any of our taps.5-The trigger water proof guard fell off after first wall and we could not get back on-very flimsy, This rubber guard holds the switch lever position which falls out, even if we had a replacement this switch would soon fall to pieces again.6-The paint stopped coming through the roller and was filling the handle and coming out of switch and handle connections, we took off and confirmed nothing was blocked including roller, put it all back together and the same happened, now we had paint blobs every where and this quick job had become a NIGHTMARE, we returned for A refund and raced out to purchase normal paint and roller and successfully completed in a couple of hours.7-My advice stay away it's a costly gimmick also if you have not cleaned correctly next time you'll have to buy another to use any paint left over. thats ONE bad review from amazon, they already agreed they paid over the odds so were probably annoyed. other reviews seem good! not the cheapest. B&Q gave 1 away with any paint purchase ages ago so got one with a tester pot. Well I've bought one, thanks OP - got to be worth a try for £5 just so you can make your own mind up. Do the Dulux paint pods HAVE to be used or could an empty one be kept/cleaned out to top up with other paints? You can refill the paint tubs with your own paint but you need atleast one tub to start with for the compact to conect to. not the cheapest. B&Q gave 1 away with any paint purchase ages ago so got … not the cheapest. B&Q gave 1 away with any paint purchase ages ago so got one with a tester pot. thats ONE bad review from amazon, they already agreed they paid over the … thats ONE bad review from amazon, they already agreed they paid over the odds so were probably annoyed. other reviews seem good! It took much longer to paint with this than with a normal roller; in fact, it really wasn't successful at getting paint on the walls at all and we gave up trying after a very short time. Add to that the extra time it takes to load it and then clean it all up after and it just adds up to a complete waste of time and money. If you can afford to throw money away, throw it away rather than buy this product. It's 4 review: 2 bad 2 good. 3.7 out of 5 @ Homebase and the larger one gets 3.9 out of 5 @ B+Q, 76% would recomend to a friend. 3.7 out of 5 @ Homebase and the larger one gets 3.9 out of 5 @ B+Q, 76% … 3.7 out of 5 @ Homebase and the larger one gets 3.9 out of 5 @ B+Q, 76% would recomend to a friend. Homebase using Argos reviews so wouldn't trust them so much. I got this free from Wilkinson's and was so annoyed with it I actually took it back and complained. They gave me a £5 credit note instead which I was happier with. I wouldn't recommend these even at the low price. Bought one of these and the 5L white paint for £24 all in. Needed to buy paint anyway for ceilings, so will do this first, empty the pot and then try "normal paint" in it after. For the price they are worth the try but you will be dissappointed, its easier and quicker to use a try and roller. When I bought it I was excited, new gadget but you soon start asking yourself whats the point. You don't need to use the paintpod paint, turn over the unit and tape or blutac down the piece that clicks into the paint pod pot. Then you can use it on any paint, I did our nusery with it got annoyed whilst cleaning it and chucked it. Got one of these the last time it was on offer. Used once and then it ended up in the bin. As others have said, it's far easier using a normal roller. Me too but I have to admit I have huge reservations, I think a standard roller would do the job quicker and cheaper. Mine is still in the box and I have no plans to use it any time soon! Not sure where you got the £40 original price from, £11 is about right for the compact one. We had one of these and they were utter crap! Had one of these. Absolute rubbish. Even at £5, it's £5 too much. I saw them in Wilkinsons on half price offer about 7 months ago (£20), went back the next day, they had all gone so bought one off EBay - all were selling for about £25 on ebay. Painted the kitchen with it - then it broke! Saw them in Wilkinsons the week after for £7 box opened - gutted! Thanks OP, just ordered one. Wilko were giving these away FREE last year with any Dulux paint bought, sold the pods, and made a saving on the paint. I have one and would highly recommend it. I got one free in the Wilkos deal. The paint is not cheap but lasts for ages. I have a good size house and did the hall, landing, stairs, lounge and dining room with one tub of paint. Took about the third of the time to paint as without the machine. BUY IT!!! I got one too, still have never used it. Think I used the batteries that came with it though - it was cheap just for those! [quote=AVANTIME] 3.7 out of 5 @ Homebase and the larger one gets 3.9 out … [quote=AVANTIME] 3.7 out of 5 @ Homebase and the larger one gets 3.9 out of 5 @ B+Q, 76% would recomend to a friend. Not sure where you got the £40 original price from, £11 is about right f … Not sure where you got the £40 original price from, £11 is about right for the compact one. Whoah... I dont thnk that was a "stupid" comment. No need to be so rude is there? These are rubbish, don't waste your money. I used to work for the company that owns Dulux and we tested these out for use in another market sector and they were just useless. Seriously. Not voting cold but just warning that they are hopeless. I had one of these years ago. Cleaning it was a long process and lots of paint got wasted in the tube. Used once then abandoned. Agree with you Martinelsen - some people are so rude. Heat for the OP.